Hi there! Thanks for stopping by. 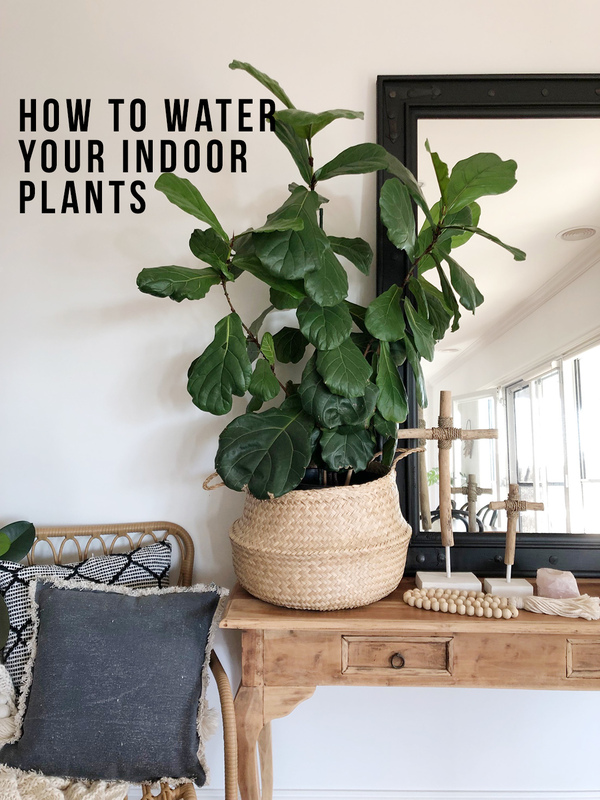 Today I thought I’d give you some steps on how to water indoor plants. Well this is how I water mine and I have lots of plants which are doing well (don’t worry, I’ve killed a few too! ), but mostly I am having some success. Did you know ALL plants need to be watered only when they need it?? Not once a week, or half a cup fortnightly or whatever… nope. Just water when they are dry! You would be surprised at how each plant is so different in when they need to be watered. Some can easily go 4 weeks when you’ve probably been watering weekly. Some have larger pots than other plants in your house. Some are super thirsty, some just need less time spent on them. So, how do you know WHEN to water them?? 1. Buy a moisture meter from Bunnings for $12. You only need the one and stick it right down in your plant every week or so and see what it tells you. It’s better to let your plants dry out a bit more than drown them. 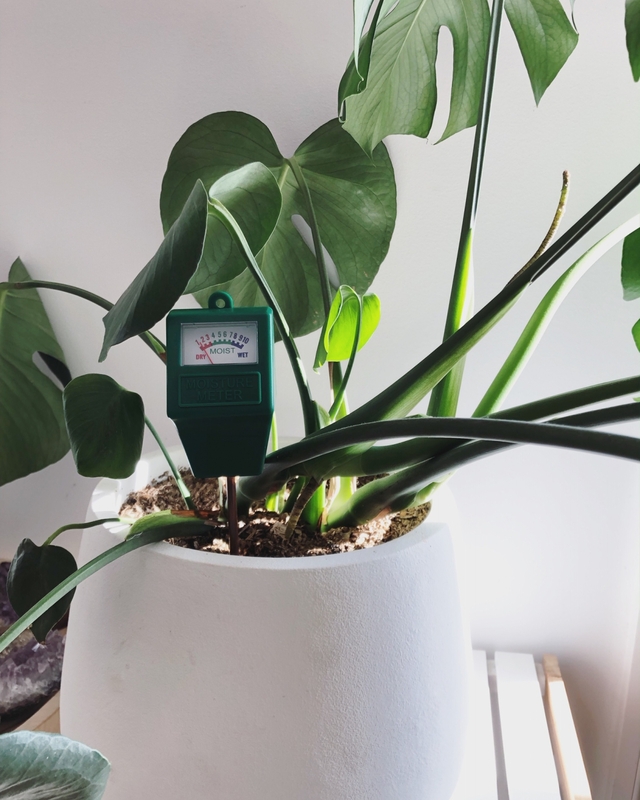 Move the meter around in your pot and if each spot tells you it’s dry then it’s time to water! If it’s moist, then leave the plant a few more days. 2. All plants (when dry) need a good soak through. When you’ve let your plant dry out, then water will rush through it. That’s probably NOT enough water. So, I either take plants outside and put them on the grass and water it through once, come back and water again 1-2 more times over about half an hour. That’s to make sure it got really wet. I prefer this way. Put the plug in your sink and fill with about 5cm of water. Water the plant through a couple of times and let the plant sit in that water for about half an hour. If you think it still looks a bit dry (because remember water can rush through easily! ), then water it again. I use Seasol from Bunnings. I add this to my plant watering every couple of months. I water in the sink for this one. Because the Seasol probably rushed through the plant, I let it sit in the leftover fertiliser and get a cup and scoop the water back on to my plant a few times. 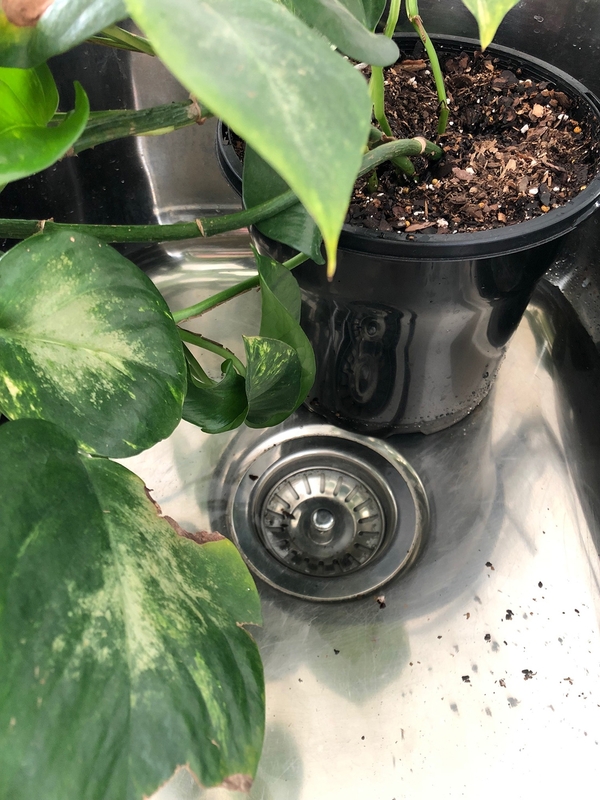 Let your plant drain really well. Don’t put it back with a really wet bottom because you’ll get root rot. 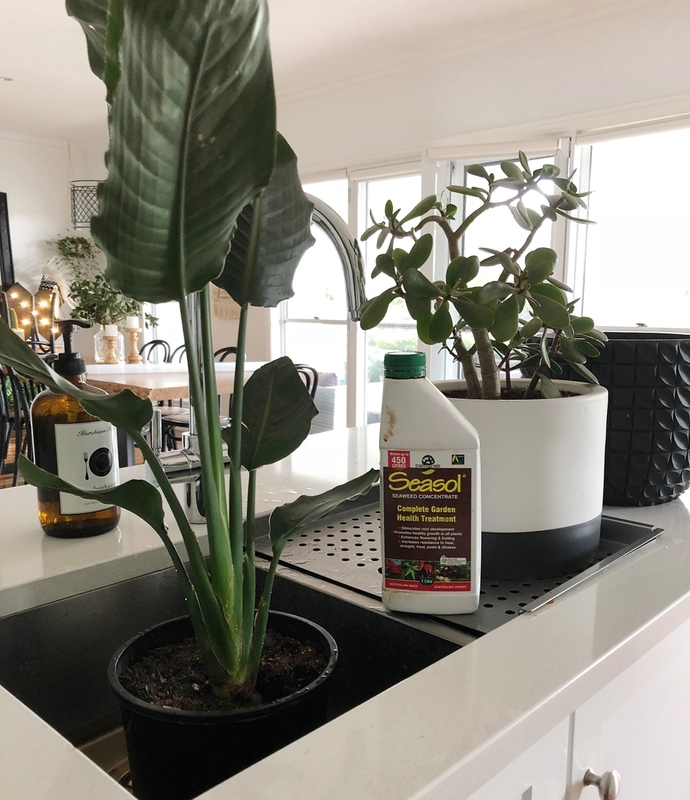 I let the plant drain for a couple of hours, then sit it on a tea towel to make sure the bottom is not dripping or really wet. Then I put it back in the basket/pot. I mostly leave my plants in the black plastic pot it came in because they have really good drainage holes. If you do all of these things, I am positive you’ll have happy and healthy plants. But don’t stress if you kill one! It just wasn’t meant to be! 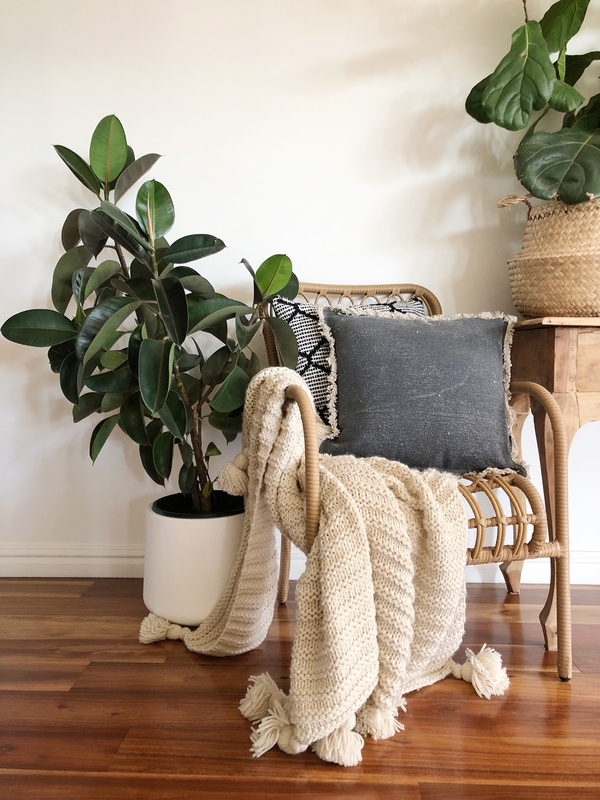 You might like this post too – What’s wrong with your house plant? 6 common problems. Next Article Next post: How to keep the garden looking beautiful with not much time on your hands! Is this a plug from bunnings? No, I’d need to declare that if it was. It does seem like a plug. Even your Instagram is encouraging people to buy them. Are you getting paid or free products by endorsing this? not being paid. not getting free product. i have a blog/Instagram account that share what I know and what works for me. I will be sure to let you know when it’s paid/gifted!